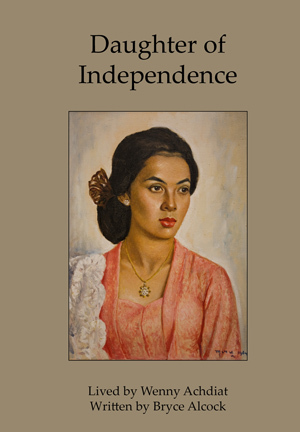 Daughter of Independence is a compelling book. Reading it is like visiting a section of Indonesian history through a deeply personal frame. Credit is also due to Bryce Alcock who presents Wenny’s story in such clear, moving prose. His knowledge and understanding of Indonesian culture is obvious without appearing ostentatious. And thanks to the cooperation of Wenny and Alcock we have a biography, a significant part of Indonesian history told in the most accessible manner, and above all, a very good read, all in one book. Other readers have also said they enjoyed the way Indonesian culture and history is woven into the story of Wenny and her father. Amy, a young Indonesian woman, enjoyed being able to “swim” around in the time of Wenny Achdiat. “It’s not like usual biographies,” she said. Go to this page for more information about the book, or this link to read the first chapter. ← Can White Authors Write Black Characters? Congratulations, Bryce and Wenny, deserved praise. I, too, am appreciating Wenny’s journey in your articulate, picture and emotion-evoking words …. Thanks, Ritamay, I’m glad you’re enjoying the book.